The popular local jackpot slot Divine Fortune has made one lucky Norwegian lady a very happy punter. There must be something in the water in Norway as it’s not the first time that a Rizk slots player has managed to hit the jackpot. Back in August 2017 a player managed to walk away with £44,053, and before that in February 2017 a win of £61,674 made it in to the Rizk Insider headlines. But this is the biggest win so far, no it might not be the multi million wins we hear of on other NetEnt jackpot games like Mega Fortune Dreams or Hall of Gods, but it’s still very much to be celebrated. Keep reading to find out how much our lucky winner was betting and what makes this game worth spinning. That’s some impressive numbers, granted you’ll need to hit a jackpot to win those kinds of figures as wins on your average video slots like Viking’s Runecraft don’t tend to go over 1,000 to 10,000 x your bet. But it goes to show, that what some people say ‘You can’t win big on mobile’ is definitely false, as it’s not the first big winner story that a jackpot game has been won either. Back in April the NetEnt Hall of Gods jackpot paid out €6,719,561 to another lucky player. Getting back to our big winner though, she was betting a decent £1.76 or around €2 per spin on the Divine Fortune game, before after just 6 minutes of play she hit the bonus round. And it was by hitting the jackpot bonus round and lining up all 5 reels and 3 rows full of golden coins that she scooped the top prize and that £85,991 or around €97,600 win. 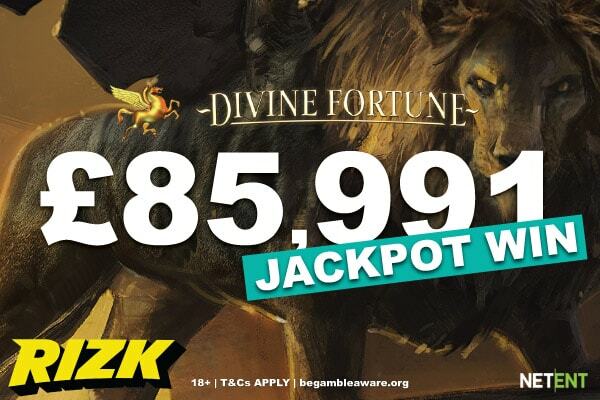 Unlike the other NetEnt jackpots we’ve already mentioned and Microgaming’s Mega Moolah, the Divine Fortune jackpot prize doesn’t increase as quickly. Why? That’s because the top prize is different at each casino that hosts the game. Instead of it being a network progressive jackpot where every bet players make at all different casinos go in to topping up the jackpot. In Divine Fortune only the bets made by players at the specific casino it’s hosted go in to making the prize total. It means it probably won’t ever reach the dizzying heights that most of us dream of, but it will trigger more often and it means you can shop around to play at new casinos where the prize is biggest. So the question though is, without the chance of winning a jackpot is this game still worth a spin? Should I take the Divine Fortune slot for a spin? It’s a game that with the expanding wilds feature can help bring some excitement to your spins, along with the free re-spins it offers giving you the chance for some decent base game wins. You can win up to and no doubt over 50x your bet in the base game alone, which for a jackpot game is quite impressive as they usually tend to be on the lower end of the variance scale. So if you’re after a few spins and like mythological creatures this game is worth taking for a spin or two. We don’t have many details on how Rizk’s lucky winner will be spending her newly won mini fortune, but we do know that she only deposited around €100 or £88 in to her Rizk account before just six minutes later filling here screen with golden coins. A day that no doubt she’ll remember for a while and one that no doubt has made Rizk mobile casino one of her new favourites if not favourite of all time. But the question is aside from the choice of jackpot games, and obvious jackpot winning history can anyone but Norwegians play here? 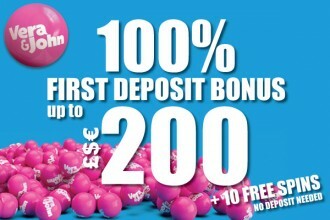 Of course, Rizk welcomes players from all over the world from Canada, New Zealand UK and more, offering a welcome bonus with no wagering on sign up where you can win anything from 10 free spins up to £€$25 in bonus money. You’ll also get fast cashouts in under 2 hours, 24/7 support to help with any queries and regular promotions offering you even more chances to win some great prizes and bonuses. Not only that but if you like to dabble in a few sports bets then they have a brand new sports betting section of their site for you to enjoy. Go see for yourself what’s on offer and who knows you might just be the next lucky winner at Rizk.